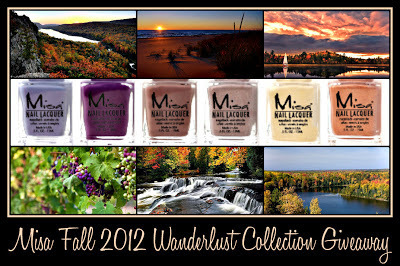 Misa's Fall 2012 Wanderlust Collection is such a beautiful range of colors for the season, and their hidden shimmer is an added bonus for me. 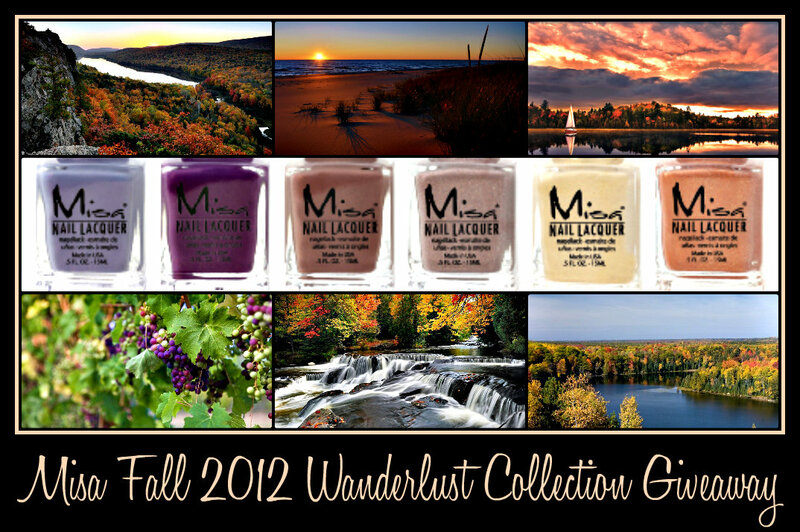 Fall is one of the most beautiful seasons here in Michigan, and this collection reminds me of some of that beauty. From the golden coppery leaves, to the grapes ripe on the vine, to the shimmering sands and periwinkle skies at sunset along Lake Michigan...that's what I associate with this collection. One lucky reader will be selected using Random.org to receive this 6-piece set. If you'd like to enter for a chance to win, just leave a comment below with your eMail and let me know what you love the most about Fall. If you aren't comfortable leaving your eMail, be sure to check back on October 19 when I announce the winner, then you can eMail me (mej0620@hotmail.com) your shipping information. Details: Contest open only to residents of the U.S., entries accepted until midnight EST on October 18, 2012, followers only, please. Prize package furnished by Misa Cosmetics. What I love most about Fall is that my birthday kind of marks its beginning. Everyone gets really excited that its October, then my birthday rolls around, then the weather dives into the 70s here in FL and everyone is in a good mood for the rest of the month! Fall is my favorite season! I love everything about fall: the cooler weather, pretty leaves, comfort food, halloween, and pumpkin flavored everything. Great giveaway! I've never tried Misa polish. Thanks! I'll be emailing you if I win! There are so many things I love about fall, but I guess my favorite has to be maple trees. I just love how some trees are completely red like a tree on fire, and how some get a gradient from green at the bottom to yellow to orange to red at the top as the leaves change more gradually. It's gorgeous, and I think I'll have to try to make a manicure out of it before the season's over. I love the autumn colors and wearing pretty sweaters and boots and knowing that Thanksgiving will soon be here as thats my favorite holiday. My favorite thing about fall is that the temperature finally starts cooling off and I am able to go outside without melting lol. Summer here is brutal. My favorite thing about fall is being cozy! Chunky sweaters, hot drinks, reading near the fireplace! I love it! I think my favorite thing about fall has to be fall/holiday beauty! I can't get enough of deeply toned lips and sparkly eyes. My favorite thing about fall is all the leaves changing color. So beautiful. Thanks for the giveaway!! This collection looks amazing. My favorite thing about fall here is bundling up, getting caramel apple cider, and walking on the boardwalk at night. I just love it. Thank you for this giveaway! My favorite part of fall is walking with my dog. He loves to kick up the leaves when they're on the ground all dry and crunchy - so cute. My mom also does gorgeous chalk pastel paintings of the changing colors. My email is j.allen27 @ gmail.com. I love the changing leaf colors and the cool, brisk weather! Thanks for holding this giveaway! The best thing about fall is the arrival of the pumpkin spice blizzard at dairy queen! It's amazingly delicious, my favorite ice cream in the world. Thanks for the giveaway, Mary! My favorite thing about fall is the cooler weather. In Florida, we don't get to see the leaves change, but it's so nice to have a break from the heat & humidity! I love sweater weather! I have a cardigan in nearly every color...and a few extra argyles too. My favorite thing about fall is the smell of the fall air! Right now feeling sick so,no good feelings about fall.But I am loving to paint my nail with fall trend this days. I ❤ Halloween! Love pumpkin sweets! I love the changing leaves and crisp air. Thanks for the giveaway! My favorite things in fall is the delicious food, the beautiful changing colors and Halloween! Not trying to enter twice, but I seem to be having a problem posting my comment, so I'm going to try again. Please count me as only one entry if both post. Sorry for the hassle. Thanks for the great giveaway. This is a very cool collection. My favorite thing about fall is the colors of the leaves! I love fall colors and thanksgiving! I love EVERYTHING pumpkin!! Especially pumpkin-flavored food! Pumpkin Spice lattes, pumpkin bread, pumpkin pie... I could go on and on! Thanks for the giveaway!! My favorite thing about fall is making a weekly to to a local orchard to pick up fresh apples. Macouns are the best!! Fall is by far my favorite season! I love the makeup,clothing, and food! But really, my favorite thing has to be the smell of fall air, so crisp and wonderful! I love all of the fall festivals in my town and our scarecrow competition! It rocks. My favorite thing about fall is the crisp cool air. I'm not at all a summer lover so when the air gets chilly and I can throw a sweater on, I'm overjoyed! I love everything about the Fall! It is by far my favorite season. I love the light, the smells, Halloween, just the feeling in general is awesome to me. Thanks for the chance to win these polishes! The thing I love most about the fall is that the leather comes out - beautiful shoes and boots, jackets, purses. I love it all! I just love the feeling of fall. The way the weather changes. It just feels fresh. What I love most about fall is the smell of it. Falling leaves, crisp air, Thanksgiving dinner cooking... etc. Thanks for hosting this giveaway! :) My favorite thing about fall is the new fall TV season ... even if the lineup is really bad. Thank you for this opportunity! Fall is my favorite season: the colors, the weather, the fashion...it just makes me so happy! I love the changing of the leaves and the cooler temps. well my birthday is Thrusday so I love that about fall lol :) but weather is definitely nice! I love the gorgeous leaves here along Lake Michigan. They turn amazing colors! I love the cold weather and the rain!! The thing I love most about fall is the change in the air, the cool temps that require putting on a sweatshirt to attend my children's school football games (which in a small town like ours is a social event for the whole town). I also enjoy the holiday Halloween and planning for costumes, parties, hayrides, etc. The best part is seeing all the changing colors of the foliage around us that we see when driving around the town and country! !